When sickness hits your home, you want to do everything you can to try to reduce the amount of exposure to the rest of your home and loved ones. The best option is making a bleach water mixture. We know that Bleach can be a scary word, however, it is one of the safest methods for disinfecting. Once bleach dries it is rendered completely harmless and breaks down into Salt and Oxygen. There is NO need to rinse afterward, unlike most household cleaners and disinfectant sprays. Make a bleach water mixture in a spray bottle. You want a 1:10 ratio. 1:10, that’s 1.6 oz Bleach (3.2 tbsp) and 16 oz water. *Please note that the bleach water mixture is only effective for a 24 hour period*. Doorknobs. Don’t forget to clean both sides of the door! Light Switches & Switch Plates. Cleaning your light switches and switch plates multiple times a day is important as these are one the the most touched items in your home. Toilet & Handle. This is especially important if you are dealing with a stomach related sickness. The toilet in its entirety should be thoroughly cleaned and disinfected after each use. Sink Handles & Faucet. It’s very important to wipe down your sink handles and faucet. This will drastically reduce exposure. It’s best to be done after each use. Soap Dispenser. One of the germiest places is the thing that helps you keep clean! Be sure to rinse it with hot water regularly to remove soap build up, and spray it with the bleach water mixture multiple times a day. Toys & Stuffed Animals. Spray hard toys with the bleach water mixture. The stuffed animals can be sprayed as well OR washed on the delicate cycle. For more information, please see our section on stuffed animals. Replace Air Filters. This will keep the airborne contaminants from recirculating. In general, it’s best to change your air filters every 1-3 months to keep dust and debris from accumulating. Change out hand towels multiple times a day, or replace with paper towels. Changing out hand towels often is a great, easy way to reduce exposure throughout your home. Change bedding and spray the mattress with a disinfectant spray such as Lysol or Seventh Generation OR lightly mist with 70% Isopropyl Rubbing Alcohol. This will help eliminate what may be on the mattress, as well as freshening it up. Spray pillows with a disinfectant spray OR with 70% Isopropyl Rubbing Alcohol and set them outside in the sun if possible. Pillows are in direct contact with your face. If you are sick, one of the best things to do is to have a clean pillow. Change the pillowcases multiple times a day if you feel it’s necessary, and spray the pillow itself as described above. Clean cell phones, remotes, tablets, keyboards, mouse, etc. with 70% Isopropyl Rubbing Alcohol. These items are some of the most used on a daily basis. While you are sick, be sure to clean these multiple times a day. Make sure everyone washes hands properly BEFORE grabbing any silverware, cups, dishes, or anything from the fridge. Hand washing is key. You want to wash your hands with hot water and soap for at least 30 seconds. Doing so will reduce the amount of bacteria on your hands, and will keep the sickness from further spreading. Open the windows if possible, even 5 minutes will make a drastic difference. Getting fresh air is always one of the best things you can do for your home. It is always get NEW toothbrushes & toothpaste. The best option to prevent re-exposure is to get new toothbrushes and new toothpaste after everyone is sick to reduce the risk of re-exposure. If new toohbrushes aren’t an option, you can also try boiling them, or soak the toothbrush heads in Hydrogen Peroxide for at least 30 minutes and air dry. When making a bleach water mixture, make sure you use a new bottle of Regular Concentrated Disinfecting Bleach OR one that has been opened within the last 9 months. 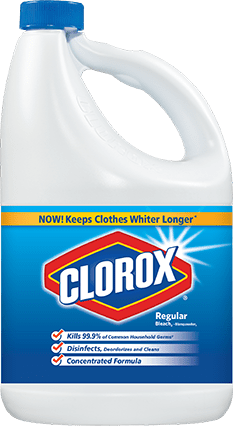 Splash-less, Scented, Bleach Crystals, and Color Safe bleach do NOT disinfect.